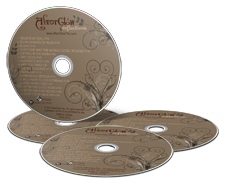 Thanks for visiting AfterGlowTrio.com to learn more about us and our newest CD Reflections! This CD includes many of our favourite songs that we love to sing in 3-part harmony. At live performances, we are normally accompanied only by Reid’s guitar and John’s percussion instruments. But, to make this CD the best it could be, we worked with some amazing musicians to fill out our sound. 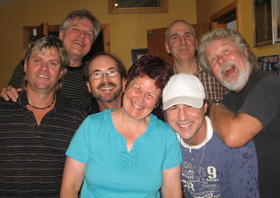 Dave Chester agreed to be our producer and we recorded at Chalet Studios in Claremont, Ontario. Dave lined up some of Toronto’s top studio musicians to back us up. We were thrilled to play with excellent guitarists Wendell Ferguson and Sil Simone; bass players Rob Laidlaw and Carey Gurden; and drummers Al Cross and Jim Burgess. Dave also added an eclectic mix of keyboard magic to many of the recordings. What a thrill for us to play with such top-notch musicians! (Click HERE to see our photo album showing more pictures of our recording sessions). We have so enjoyed this recording process that has lead us to our ultimate goal – to get our music out to you, that you may enjoy our musical gift. You can listen to sample sound clips of all the songs on the CD. Please visit our SAMPLE page. You can buy our CD “Reflections” for just $10.00 using Paypal or by filling out an Order Form and sending it to us with your cheque. Please visit our easy to use BUY NOW page. See what some listeners are saying! Thanks to everyone who participated in our "CD Cover" vote. 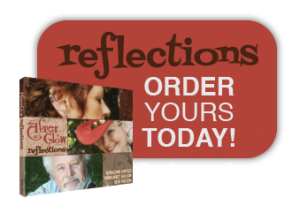 Our CD "Reflections" is now available. It's a great collection of some of our favourite songs. Listen to some samples - Click here. "Congratulations on your CD! The voices are very soothing and a pleasure to listen to. Good choice of material too."